In the dim and distant days of the late 1970's getting hold of interesting drug literature in the small northern town where I lived was difficult, to say the least. The glory days of the British underground press and their regular reports on Cannabis and LSD price, availability and quality, were past. America's High Times was useful for some drug information, but a bit, well, 'American'. 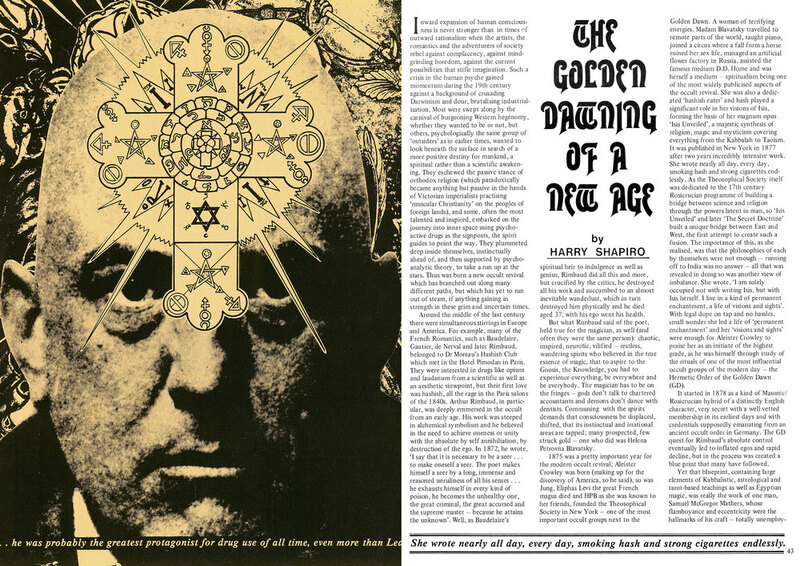 On the grapevine I heard rumour of a new, British based, drug magazine due to be published in 1977, by the already legendary Lee Harris, owner of London's oldest Headshop, 'Alchemy'. I had no idea how to obtain this magazine, and newsagents just looked blank and not a little suspiciously when I asked if they stocked any magazines about drugs. Eventually a trawl of newsagents in Bradford unearthed the first issue. Wow! This was just what the 22 year old me wanted. That first cover, with its promise of 'LSD and the Mynd Alchemist' and the 'Ganja of Love' drew me in. Acid and dope on the cover of a British newsstand magazine? Wow again! I read it from cover to cover even before the number 56 bus had deposited me back in the cultural wasteland that was Cleckheaton. I eagerly bought each subsequent issue as it was published, and my drug culture knowledge and imagination was vastly expanded as I read articles written by people who were, to me at least, iconic and legendary figures in the psychedelic counter culture. This stuff was hot! 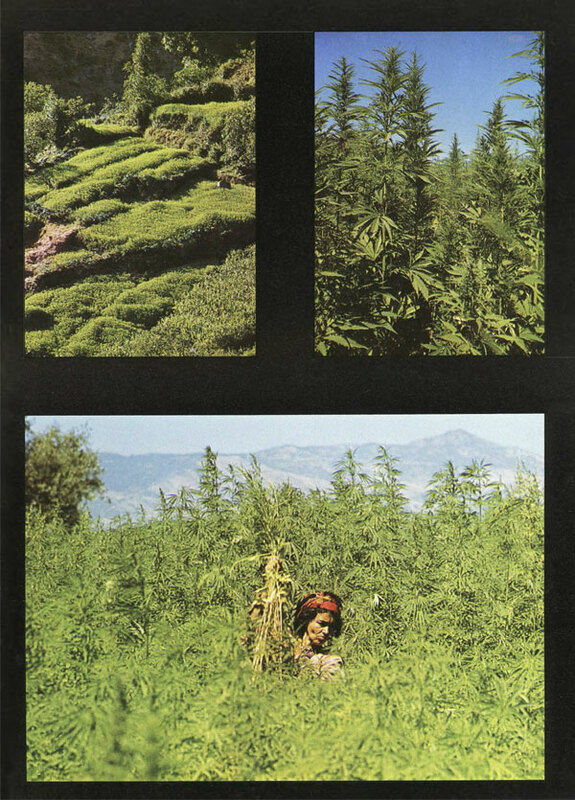 Where else could one read of Laurence Cherniak's explorations of the world's hashish making centres, or critiques of the Operation Julie LSD busts? This factual underground reportage was balanced by more far out, first hand, experiential accounts of what it was like in the psychedelic trenches, such as Brian Barritt's knowing account of acid dealing, and beyond, in Amsterdam. All that and much more, including the trippiest covers and internal artwork to muse upon when high as god's hat! Poems and Head cartoons from the likes of Bryan Talbot randomly dotted the pages, all adding to the magazine's kaleidoscopic, hallucinatory vibe. Just reading Home Grown was enough to give you a contact high! But Home Grown was more than a drug magazine. Much more. For the hip, already in the know, tokers and trippers the magazine reflected and amplified the underground hippie sub culture they were already firmly a part of. But for the legions of hippies, freaks and heads scattered across the length and breadth of Britain, Home Grown was a rallying call, a pulse of psychoactive weirdness, beaming out the Incredible String Band's message of a decade earlier 'We're all still here, no one has gone away'. Home Grown was one of those rare written artefacts that collated condensed and transmitted the ever expanding and changing culture of 'our tribe'. 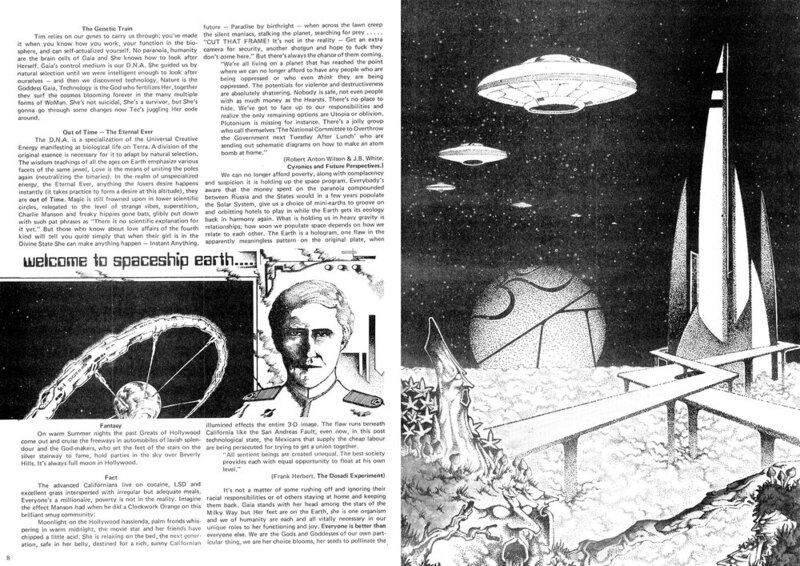 Between 1977 and 1982, Lee published 13 Issues of Home Grown. It should, of course, have lasted and be now celebrating its 500th edition or so. But Britain was changing. The economic bone mill of Thatcherism was slowly grinding the life out of the 60s and 70s psychedelic explosion and the hippie counter culture was rapidly coming down from that trip. Copies of Home Grown soon became scarce, then rare, then impossible to find. A reprint of issue one surfaced briefly and a 'best of' Home Grown published in 1994 enabled the interested and those who had lost their original copies to reminisce. Lee Harris remained legendary and got on with the running of 'Alchemy', his Headshop in the heart of London's Portobello Road and Home Grown gradually faded from the minds of all but the faithful and historians of the importance of Britain's drug culture. You could still hunt out issues of Home Grown but full sets of the magazine were changing hands for more than the price of an ounce of high quality hashish! Fresh from adding to his legendary status by running as a candidate in the elections for London's mayor, (visit lee4mayor.com) in which he garnered over 80,000 votes, Lee has once again turned his attention to the legacy of Home Grown, realising it was too meaningful, too relevant to be allowed to fade into permanent obscurity . So now, Home Grown is back, digitised and available for all in the 21st century. The colours are as vibrant as ever, the articles now more pertinent than in the 70s and the artwork fresh as a dosed daisy. Add to that the quaint and curious advertisements for head shops long gone and paraphernalia to tickle your fancy and you have a living breathing artefact of yesterday's tomorrow today. Besides the entirety of Home Grown's back catalogue, Lee intends to make available unpublished articles, letters and other Home Grown related stuff. A blog, a forum and a search tool feature in the Home Grown site and will become another invaluable addition to the uncovering and dissemination of the hidden history of drug culture, a culture we should all be proud to be a part of and which we should cherish and sustain for the future. As Lee says, 'One love'! Your digital magazine is waiting. From 1977 until 1982 Lee Harris started and edited Britain's first counter culture and drug magazine. HomeGrown was a breakthrough magazine that represented a defining moment in British underground culture. Lee was reporting on the psychedelic experience andHomeGrown magazine was one of the few publications to support Operation Julie defendants and included articles and illustrations from Timothy Leary, Michael Hollingshead, Harry Shapiro, Brian Barritt, Mick Farren, Bryan Talbot, Julie Burchill, Peter Tosh and Tony Parsons.